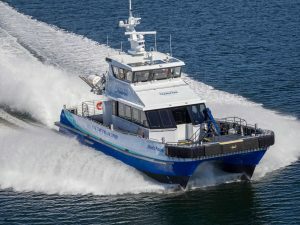 Warren, R.I. (October 17, 2018) – Blount Boats has signed a contract with the New York Power Authority (NYPA), the nation’s largest state power organization, to construct an ice breaking, all-welded-steel, diesel-powered, double screw tugboat to operate in seasonal ice near the entrance to and within the upper Niagara River. This vessel will replace existing vessels in the NYPA fleet currently used for the installation, removal, and maintenance of the Lake Erie Ice Boom and various associated marine construction projects. The naval architectural and marine engineering firm, Bristol Harbor Group, Inc. developed the contract design and will provide technical oversight during the fabrication process on behalf of NYPA. 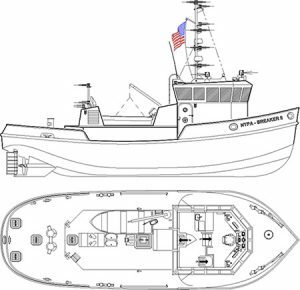 The 56’x18.5 shallow draft tug will be powered by two Caterpillar series C-9 engines, each 375HP@1800 RPM. The vessel’s hull, machinery, electrical systems and safety equipment will comply and, be inspected in accordance with USCG Subchapter M – Towing Vessels. Warren, R.I. (February 14, 2018) – Blount Boats has signed a contract with Fire Island Ferries to construct an 85 foot aluminum ferry boat for service between Bay Shore and Fire Island on Great South Bay. This vessel is a sister ship to the M/V Fire Islander (Hull 368) built by Blount Boats in 2013. 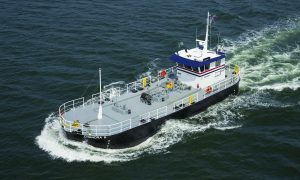 In review, the Blount Shipyard has built the following vessels for the Fire Island Ferries fleet: Capt. Patterson (1972), Fire Island Miss (1976), Traveler (1977), Vagabond (1979), Fireball (1981), Firebird (1983), Fire Island Flyer (2001), Fire Island Belle (2009), and Fire Islander (2013). 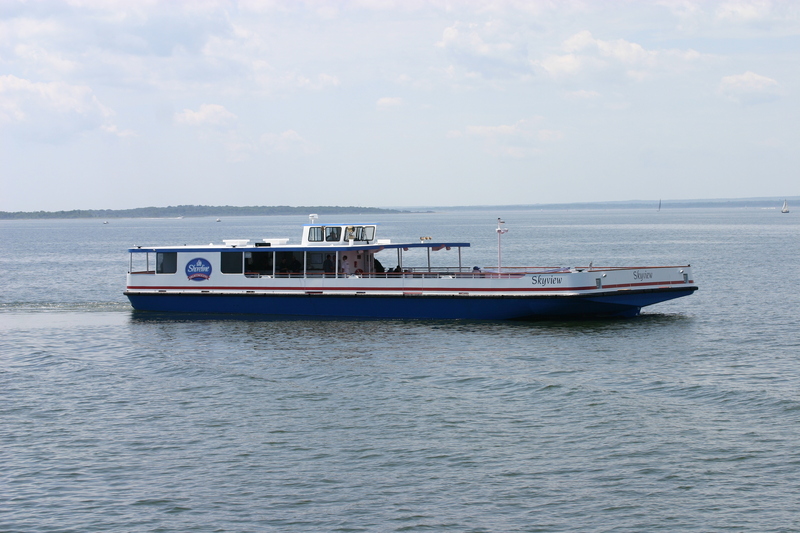 Fire Island Ferries has been in operation since 1948 and supplies fast marine transportation services from Bay Shore, Long Island to Fire Island. WARREN, RI (July 10, 2017) – Blount Boats together with Elliott Bay Design Group (EBDG) has been awarded the contract to design and construct a new passenger-only ferry for Governors Island, New York by The Trust For Governors Island (Trust). The Blount/EBDG partnership combines their extensive knowledge, skills and experience in the design and construction of ferries. “Blount Boats is honored to have been chosen by the Trust to build another iconic vessel for New York Harbor,” Marcia Blount, President of Blount Boats, said upon award of the contract. Robert J. Pelletier, Vice President of Blount Boats, will be Project Manager for the construction at the Blount shipyard. “EBDG looks forward to working with Blount and designing a quality vessel for the Trust,” Matt Williamson, PMP, Project Manager for the Design said about the award. As the recognized national leader in ferry design, EBDG’s scope of work includes contract and detail design along with vessel delivery support. The vessel will provide passenger ferry service between Battery Maritime Building in Lower Manhattan and Soissons Landing on Governors Island, New York. The initial vessel design will have a maximum holding capacity of 400 passengers, with a length of 132′, a beam of 40′ and a depth of 13′. The vessel will be built to meet USCG Code of Federal Regulations (CFR) 46 Subchapter K.
ABOUT BLOUNT BOATS Blount Boats is a full service shipyard in Warren, Rhode Island offering innovative construction services for the marine industry. Hundreds of Blount built boats have been put into service, including passenger vehicle ferries, commuter boats, dinner excursion boats, passenger ferries, small cruise ships, bunkering tankers, tugs, commercial trawlers and wind farm service vessels, since its founding in 1949. This new vessel will join many other Blount boats currently working in New York Harbor such as the fleet of vessels operated by Statue Cruises taking visitors to the Statue of Liberty including “Miss Liberty” (Hull #15) built in 1954, the “Michael Cosgrove” (Hull #76) built in 1962 for the City of New York and still in service, and the “Sensation” (Hull #278) built in 1989 and purchased and retrofitted in 2015 by Hornblower Cruises and Events. For more information, please visit their website http://www.blountboats.com. ABOUT ELLIOTT BAY DESIGN GROUP Elliott Bay Design Group LLC (EBDG) is an employee-owned company with offices in Seattle, New Orleans and Ketchikan that provides naval architecture, marine engineering and production support services to owners, operators and shipyards across the country. With a focus on responsiveness, EBDG delivers designs that are better to build and better to operate. For more information, please visit their website http://www.ebdg.com. Warren, R.I. (July 2016) – Blount Boats of Warren, Rhode Island delivers the M/V Skyview to Shoreline Sightseeing, Chicago. With a LOA of 100’ and maximum beam of 35’ the steel, Subchapter K passenger vessel designed by Seacraft Design, LLC is certified to carry up to 318 passengers and will operate as an architectural tour boat in partially protected waters. The vessel is powered by twin Volvo D13 MH, 400hp diesels with twin 65 kW John Deere generators, ZF W325 gearboxes, 2.933:1 ratio supplied and commissioned by Allemand Industries, Harvey, LA. The vessel is also equipped with twin 44” diameter, 4-blade propellers and Kobelt Steering. The vessel was specifically designed with a recessed pilot house to meet the air draft requirements for navigating the waterways of Chicago. Special features include hand-crafted mahogany doors, railings and bench seating, full-service bar, 20-keg beer cooler, ladies and men’s heads (heated), 430 pound ice machine and air-conditioning. The M/V Skyview marks the second vessel built by Blount for Shoreline Sightseeing. (April 13, 2016) Blount Boats has delivered the Atlantic Pioneer, America’s first U.S. Flagged Crew Transfer Vessel (CTV) for Atlantic Wind Transfers that will begin service for Deep Water Wind Block Island at the end of May. The 21 meter aluminum vessel was designed by South Boats IOW (Isle of Wight), recognized as a pioneer in designing and manufacturing crew transfer vessels. South Boats IOW has designed and built approximately 81 crew transfer vessels for the European Offshore Wind Sector servicing wind farms throughout Europe. In 2011 Blount Boats signed an exclusive licensing agreement with South Boats covering the U.S. offshore wind industry. The South Boats’ 21m is a twin hulled, all aluminum catamaran, dual certified to USCG Subchapter T (Small Passenger) to carry up to 47 passengers and subchapter L (Offshore Supply Vessel) to carry up to 16 offshore workers. The propulsion system consists of two (2) MAN V12-1400 hp engines, ZF Marine 3050 Gears, and Hamilton Jet HM571 waterjets. The vessel exceeded the contractual performance reaching sprint speeds in excess of 30 knots, with the ability to cruise (80% power) at 26 knots when in a light condition. A Cummins Onan 17kw generator provides AC power to the air conditioning system, a heating system and small galley. A PTO driven hydraulic system powers a deck crane, fire pump, fuel transfer pump, and a salt water pressure washing system. All other equipment is fed DC power through house batteries. The vessel was specifically designed to carry up to 12 tons of cargo in the bow and 3 tons of cargo in the stern. The forward and after decks are outfitted with cargo lashing and container sockets. A knuckleboom crane is outfitted onto the bow area. The bow has a bow boarding/loading platform to allow offshore workers to make the transition from the vessel to the wind turbine. The vessel connects to the turbine base by use of a special bow fendering system. The specified fender is the latest generation in proven fendering systems being installed in the European fleet. The vessel is capable of making transfers in 1.5m significant wave heights. The interior of the deckhouse is outfitted with a head, a small galley area with settee seating, twelve (12) suspension seats, storage lockers, entertainment system, Wi-Fi, and sound absorbing decking. The entire deck house is isolated from the hull with vibration mounts for a quieter and smoother ride to and from the work site. 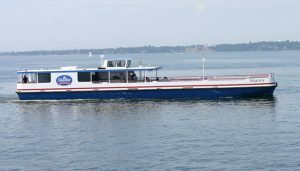 (December 14, 2015) Blount Boats, Inc. signed a contract on June 30th to build a 100 x 35 foot steel passenger ferry boat for Shoreline Sightseeing Co., Chicago, Illinois. The new vessel was designed by Seacraft Design, LLC, Sturgeon Bay, WI. The proposed 300-plus passenger, Sub-Chapter K vessel will operate as an architectural tour boat in partially protected waters. 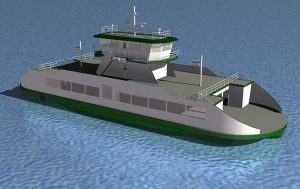 The vessel will be powered by twin Volvo D13 MH, 400hp diesels with twin 65 kW John Deere generators, ZF W325 gearboxes, 2.933:1 ratio and 44” diameter, 4-blade propellers. This is the second vessel being built by Blount for Shoreline and delivery is slated for spring 2016. (September 16, 2015) Blount Boats has completed the 79×23-foot bunkering tanker CHANDRA B for American Petroleum. The design by Farrell & Norton Architects was built to USCG Sub-Chapter D specifications and will operate in New York Harbor and New Jersey. The vessel which will be replacing the Captain Log was delivered on September 6, 2015. The vessel is equipped with (2) Tier III Cummins Model QSL9, six-cylinder diesel engines rated at 330hp at 1800 rpm with ZF Model W325 marine hydraulic gears that will have 4.91:1 reduction ratio. The vessel is also equipped with a 50hp Wesmar hydraulic bow thruster. The cargo tankage is designed to hold a capacity of 56,450 gallons. American Petroleum & Transport (AP&T) started in April 1996, and began supplying fuel to ferries, dinner boats, and commuter equipment with a small self-propelled tanker. In 2005, the company purchased the Patrick Sky and Scotty Sky and began bunkering fuel and transferring heating oil. In anticipation of OPA 90, AP&T built the James Joseph to replace these two vessels which were built by the Blount shipyard. The Patrick Sky (L.G. LaDuca) was built in 1960, and the Scotty Sky (L.G. LaDuca II) was built in 1966. January 9, 2015: Blount Boats signed a contract with American Petroleum & Transport, Inc. to construct a 79×23 foot, double hull, steel, fuel bunkering tanker for service in New York Harbor and New Jersey. The vessel was designed by Farrell & Norton Naval Architects and will be built to USCG Subchapter “D” specifications and admeasure to less than 100 GRT. The vessel will be powered by two, Tier III Cummins Model QSL9, six-cylinder diesel engines rated at 330hp at 1800 rpm with ZF Model W325 marine hydraulic gears that will have 4.91:1 reduction ratio. The vessel will also be equipped with a 50hp Wesmar hydraulic bow thruster. The cargo tankage is designed to hold a capacity of 56,450 gallons. Delivery for Hull 365 is scheduled for August 2015. American Petroleum & Transport (AP&T) started in April 1996, and began supplying fuel to ferries, dinner boats, and commuter equipment with a small self-propelled tanker. In 2005, the company purchased the Patrick Sky and Scotty Sky and began bunkering fuel and transferring heating oil. In anticipation of OPA 90, AP&T built the James Joseph to replace these two vessels. They are now contracting with Blount Boats to build the tanker, CHANDRA B to replace the Captain Log. 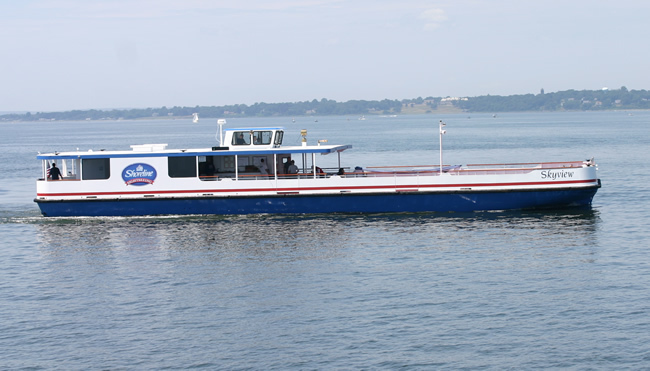 Warren, RI (May 19, 2015) Blount Boats is pleased to announce that it has signed a contract with Rhode Island Fast Ferry for the construction of a 21 meter crew transfer vessel (CTV) that will operate for Deepwater Wind Block Island. The 21 meter aluminum vessel was designed by South Boats IOW (Isle of Wight), recognized as a pioneer in designing and manufacturing crew transfer vessels. They have designed and built approximately 85 CTV’s for the European Offshore Wind Sector and by threefold has the largest market share, largest product range and greatest experience with their vessels working on all of the European and UK wind farm projects. In 2011, Blount Boats signed a licensing agreement with South Boats to become the exclusive shipyard to manufacture U.S. Flagged aluminum catamarans of South Boats IOW designs for the U.S. wind farm industry. The South Boats’ designed stock 21m wind farm vessel is a twin hulled, all aluminum catamaran. It will be dual certified to USCG Subchapter T (Small Passenger) to carry up to 49 passengers and subchapter L (Offshore Supply Vessel) to carry up to 16 offshore workers. The propulsion system consists of two (2) MAN V12-1400 hp engines, ZF Marine 3050 Gears, and Hamilton Jet HM571 waterjets. The vessel is predicted to reach sprint speeds in excess of 28 knots, with the ability to cruise (80% power) at 27 knots when in a light condition and 23 knots in loaded condition. A Cummins Onan 17kw generator will provide AC power to the air conditioning system, a heating system and small galley. A PTO driven hydraulic system will power a deck crane, the fire pump, a fuel transfer pump, and a salt water pressure washing system. All other equipment will be fed DC power through house batteries. The vessel is specifically designed to carry up to 12 tons of cargo in the bow and 3 tons of cargo in the stern. The forward and after decks are outfitted with cargo lashing and container sockets. A knuckleboom crane will be outfitted onto the bow area. The bow has a bow boarding/loading platform to allow offshore workers to make the transition from the vessel to the wind turbine. The vessel connects to the turbine base by use of a special bow fendering system. The specified fender is the latest generation in proven fendering systems being installed in the European fleet. The vessel will be capable of making transfers in 1.5m significant wave heights. The interior of the deckhouse will be outfit with a head, a small galley area with settee seating, twelve (12) suspension seats, storage lockers, entertainment system, Wi-Fi, and sound absorbing decking. The entire deck house is isolated from the hull with vibration mounts for a quieter and smoother ride to and from the work site. Delivery is scheduled for April 1, 2016 with vessel entering service by May of that year.